I live in Canada and my gggrandfather was Thomas Marson – landlord of The Jolly Boatman Inn on Awsworth Road in 1859 and landlord of the Old Harrow Inn in 1850. I knew he was a brewer, but did not know of the Pubs he ran. He married Ann Noon whose father was Robert Noon of The Shiply Boat Inn. If you have any other Marson or Noon tidbits, I would love to hear them. Thomas Marson has appeared a couple of times on the site though not with a lot of personal detail. His name does crop up quite often in the local newspapers of the time and in the future I will certainly look more attentively for his name and pass on to you any information I find. Thomas appears to have arrived in Ilkeston in the late 1840′s with his first wife Mary (nee Fell) who was born in Helpstone, Northants, daughter of stone mason John and Mary. Thomas and Mary had married at St Mary’s Church in Nottingham on Mar 28th 1847 when the groom described himself as an ostler of Long Row, Nottingham. By 1855 he was at the Jolly Boatman at Canal Bridge off Awsworth Road (Post Office Directory 1855/ White’s Directory 1857/ Harrison, Harrod & Co Directory 1860) … and then seems to disappear from the Directories. On the 1861 Census he is in North Gate, close to the Durham Ox Inn and on the 1871 Census he lives by the Market Inn in the Market Place .. brewing its beer? He married his second wife Ann Noon on Mar 23 1853 at Christ Church, Cotmanhay, daughter of innkeeper Robert and Lucy Mable (nee Sharp). By then Ann had her illegitimate daughter Elizabeth Noon, born Dec 5th 1846. 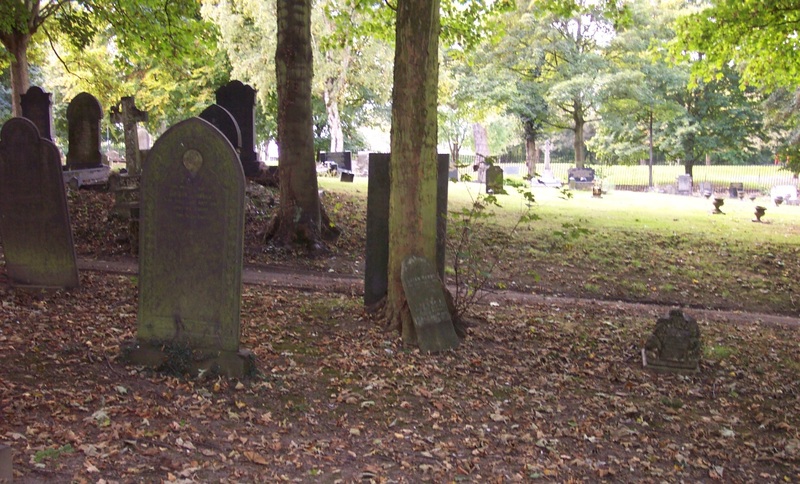 Thomas died at Rutland Terrace, Ilkeston on Dec 26th 1895, aged 76, and was buried three days later in Park Cemetery, Ilkeston (grave number 4318).. his wife Ann was buried in the same plot when she died in 1913. The site of the Marson grave. It is to the fore of the stone leaning against the tree. There seem to be no visible signs remaining.